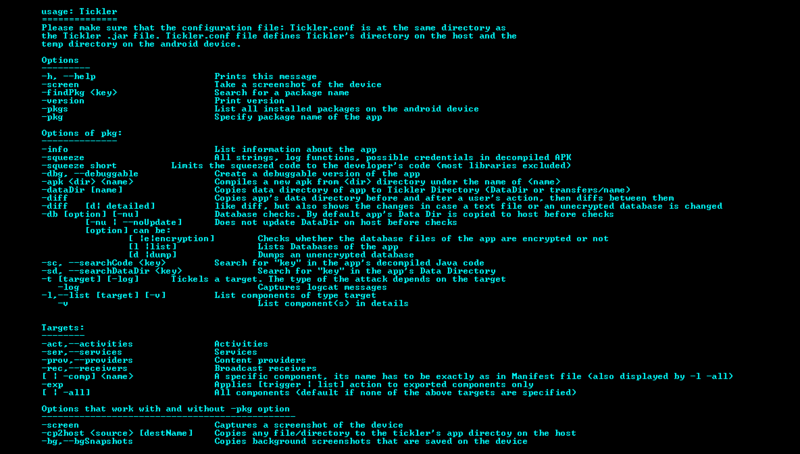 Browse: Home / AndroTickler – Penetration testing and auditing toolkit for Android apps. A java tool that helps to pentest Android apps faster, more easily and more efficiently. AndroTickler offers many features of information gathering, static and dynamic checks that cover most of the aspects of Android apps pentesting. It also offers several features that pentesters need during their pentests. AndroTickler also integrates with Frida to provide method tracing and manipulation. It was previously published under the name of Tickler. + extracted directory: Output of apktool on the app, contains smali code, resources, libraries…etc. + bgSnapshots directory: Contains background snapshots copied from the device. + images directory: contains any screenshots taken for the app. libs directory and Tickler.conf configuration file exist in the same directory of the jar file. 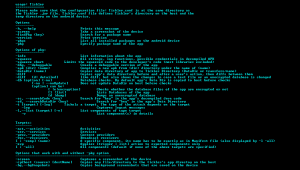 The configuration file sets the location of TicklerDir directory on the host and Tickler on /sdcard of the android device. If the configuration file does not exist or these 2 directories are not set, then default values will be used (Tickler_workspace on the current directory and /sdcard/Tickler respectively). Tickler_lib directory contains some Java libraries and external tools used by AndroTickler such as apktool and dex2jar. ← iwsniff is a TCP/UDP password sniffer based on decode routines in dsniff.